During his many years in France, the American sculptor George Grey Barnard acquired a large number of Gothic and Romanesque architectural elements from decayed villages in the countryside. Columns, arches, doors, rooms, and whole buildings made up his growing lot. In 1930, during one of Barnard’s financial crisis, he sold his collection to John D. Rockefeller Jr. The notorious American tycoon, in one of his many philanthropic initiatives, decided to move the collection to the USA and integrate it into the Metropolitan Museum of Art as a sort of sub-division dedicated to Medieval art: the Met Cloisters Museum. From 1934 to 1939, the cloisters of Cuxa, Saint-Guilhem, Bonnefort, and Trie were dismantled and transported to Fort Tyron Park in upper Manhattan. The architect of the new museum, Charles Collens, was given the task of reconstructing the cloisters using only the architectural elements contained within the collection. Through the processes of appropriation and rejection of specific parts of the four cloisters, the assimilation of meanings and constructive principles, and the final conciliation of each piece, Collens created a new model for the cloister, an eclectic assemblage representing an entire European typology. Beyond any criticism regarding the context and ethics of the Met Cloisters, what we wish to focus on is the intention it represents of building a new identity by making use of previously existing elements. The project by Charles Collens seems to corroborate the possibility of making a seemingly direct analogy between the sociological theories of Lacan—among others—regarding the building of one’s own identity solely through the interaction with pre-existing traces and conditions. It also raises questions regarding the role of the architect in the project’s process: is Collens the author of the Met Cloisters? 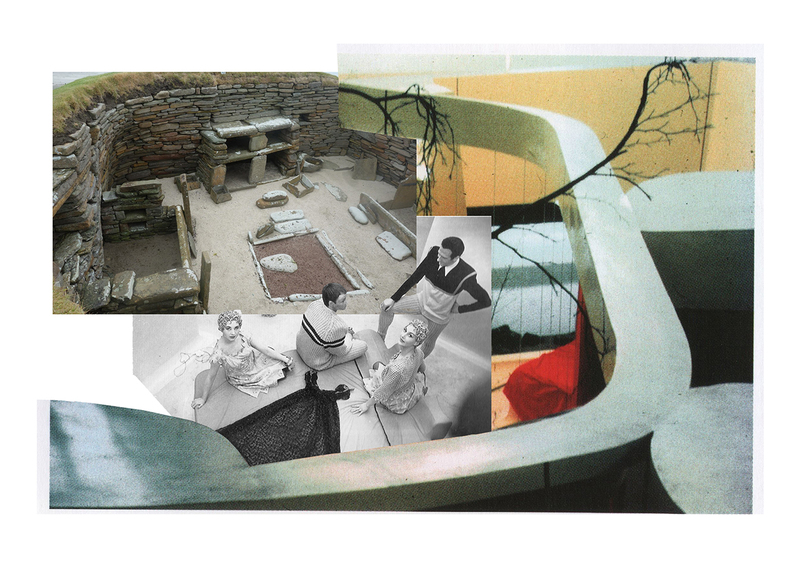 This fifth and final issue of the CARTHA on Building Identity cycle approaches the questions posed in the four previous issues, each addressing a specific “identity process”—Appropriation, Assimilation, Denial and Conciliation—through a different medium and focusing on projectual answers sourced from an international group of architects. The practices Made In, Sam Jacob, Monadnock, Bruther, Bureau Spectacular, Conen Sigl and Muoto have been invited to take on a projectual task similar to the one Collens undertook. 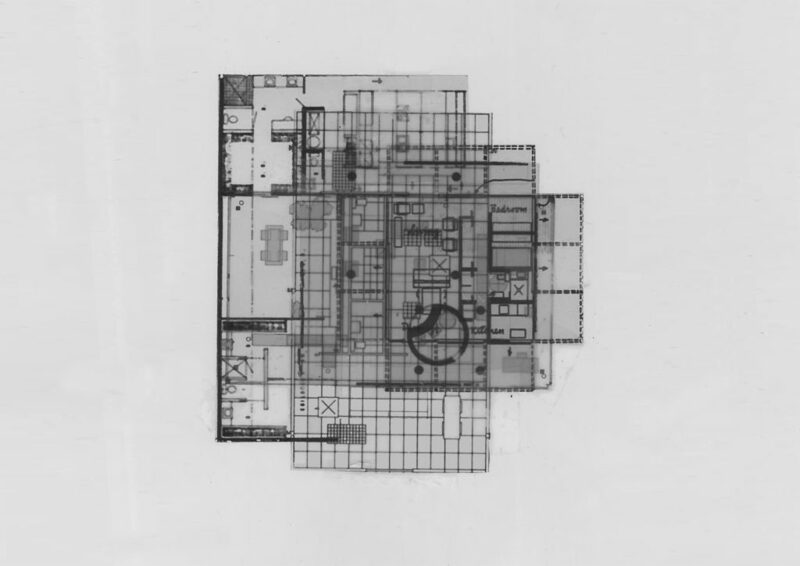 The aforementioned identity building processes acted as guidelines for the design process, challenging the architects to design a new dwelling (house, apartment, manor, hut, etc), drawing from projects inserted in their own conceptual, social, and physical contexts but not designed by them. Alongside the projects, a commentary by Kenneth Frampton on the relation between identity and architecture widens the scope, questioning which role could architecture play in the current global political situation, and proposing a new lenses through which one can look back at the whole cycle. The departing questions for this cycle are not only addressed but also answered in this last issue. 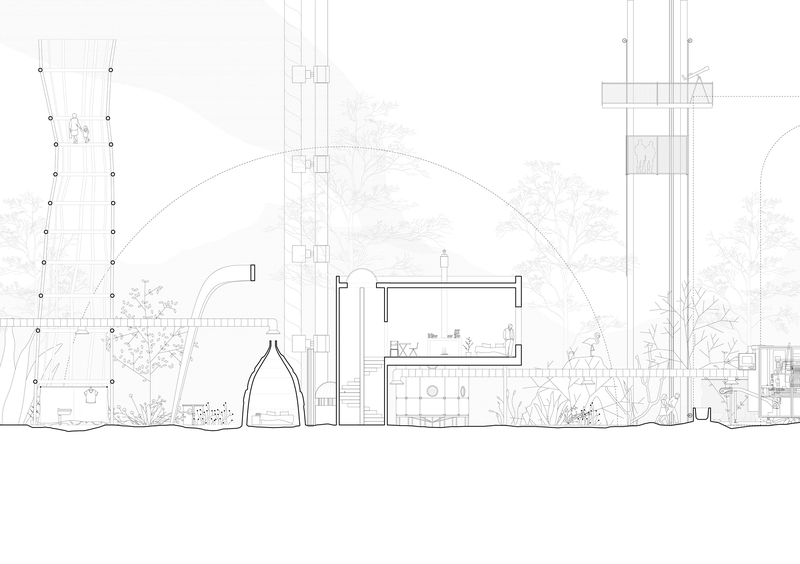 The results of the speculative design exercise, beyond featuring a richness of references and depth of understanding of the meaning of previously built projects, promote a reflection on the contexts and situations the invited architects face. Interests in the current notions of social interaction, ideas of property, drastic shifts in environmental conditions and conceptions of history and future are brought forth in critical, seductive ways. The virtuosity displayed in the projects thus allows us to answer the question of authorship, for the creation of new meanings is indeed the emergence of a new identity, therefore of an independent person, a self. Furthermore, when facing the projects featured in this issue, alongside the visual and text essays published throughout the cycle, identity does seem to be able to promote a positive complexity in architecture, even when addressing the most common, most essential of typologies. Nevertheless, it is not our intention to present an approach to architecture through identity as a definitive path, rather to propose it as an enriching complementary analysis and project methodology. The notion of identity, as proposed by this cycle, forces one to adopt a critical position towards a context. It promotes a deep understanding of what the now is by asking why it is so, what has been rejected if this has been appropriated, what has been lost in the constant processes of assimilation, and what the outcome of a more conciliatory approach might be. With a career that spans through the last 5 decades, Kenneth Frampton has been a fundamental figure in architecture critique. Through teaching, writing, editing, and curating, his work has become key in the understanding of modern and contemporary architecture. “Towards a Critical Regionalism: Six Points for an Architecture of Resistance” (Among many of his writings) remains a pivotal and highly influential essay, which had already in 1982 advocated for an alternative to modernism, suitable for a postmodern society that would go beyond an aesthetic discourse. In the current context of global neoliberalism, architecture is increasingly instrumentalized as a political tool, an apparatus that constructs and produces identity. CARTHA asks how architects today can question anew the tenants of Modernism through a series of identity-building process—Assimilation, Appropriation, Rejection and Conciliation—in order to reimagine how architecture can achieve a new agency within contemporary social, economic, and political structures. One could say that the historical failure of social democracy has left the society bereft of any agency for its self-realization that is not compromised by the market and rampant consumerism. Generally speaking, right wing political parties in the Anglo American world have no vision whatsoever for the future of the society other than enabling the super-rich to escape reasonable taxation, make even more money and worsen the already unacceptable maldistribution of wealth. Where functioning welfare states still prevail, as in Scandinavia, the possibilities for maintaining social security, national health, free education and public transit which are paid for by taxation, the architectural profession still has a basis on which it can contribute to the identity of the society. It may also be argued that where the city-state still survives in Italy or Spain, the profession may contribute both to the social well being and the identity of the local community. Given the Dark Neoliberal Age in which we live the role of architecture in the formation of social identity is extremely curtailed. Your questions seem to anticipate nothing about the future of climate change and the latent capacity of maximizing techno-science to pollute an entire planet. One notes that Europe has played a resistant role in this regard. I cited Alvar Aalto as an exemplary figure because while he remained committed to the modern project he did so in a way that was always attentive to climate and topography. Moreover, he employed a language which was was accessible as opposed to current spectacular displays of instrumental form, totally indifferent to the psychological well being of the user. 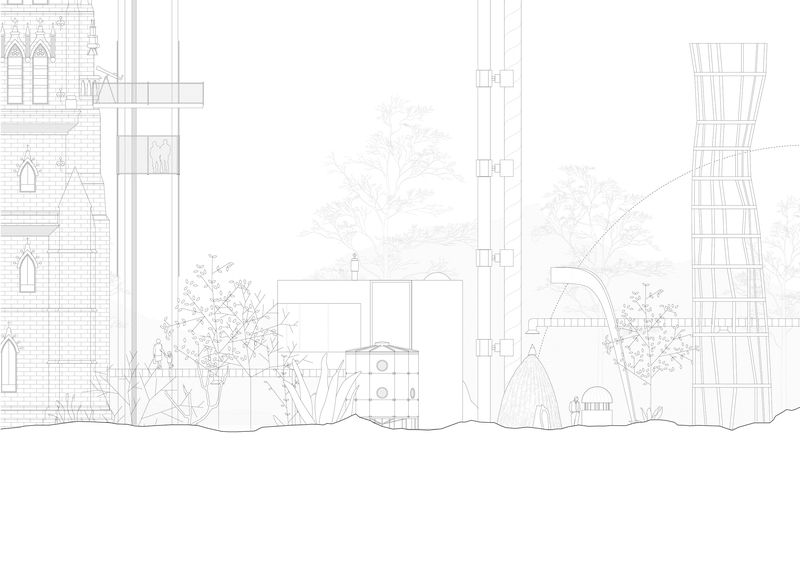 In response, CARTHA maintains that building identity is intrinsically linked to place: the climates, ecologies, topographies, and socio-political structures that contextualize architecture are fundamental to its formulation and understanding. Critiquing Modernism’s desire to reject architecture’s histories and restructure the city through the appropriation of new ideological frameworks, this cycle is a response to that legacy of detachment. It postulates the impossibility of the tabula rasa, placing social, cultural, and geographical contexts at the center of any design process. By reframing architecture through the processes of building identity, the essays and design speculations contained in CARTHA’s current cycle offer a point of resistance to the universalizing tendencies of globalization. Kenneth Frampton is the author of Modern Architecture and the Critical Present(1980), Studies in Tectonic Culture (1995), American Masterworks (1995), Le Corbusier (2001), Labour, Work & Architecture (2005), and most recently, L’Altro Movimento Moderno (2015) and A Genealogy of Modern Architecture: Comparative Critical Analysis of Built Form (2015). He is currently at work on an expanded fifth edition of Modern Architecture: A Critical History. Frampton teaching was the subject of the 2017 exhibition Educating Architects: Four Courses by Kenneth Frampton at the Canadian Centre for Architecture, where his archive is held. Metropolis Magazine named him a Gamechanger in January 2018. Frampton was recognized with the Golden Lion for Lifetime Achievement at the 2018 Venice Biennale for Architecture. The Archaeographic House is formed through the marriage (happy or not) between two homes that bookend the history of British housing. The first is Skara Brae, a stone-built Neolithic settlement in Orkney occupied from roughly 3180 BC to about 2500 BC. 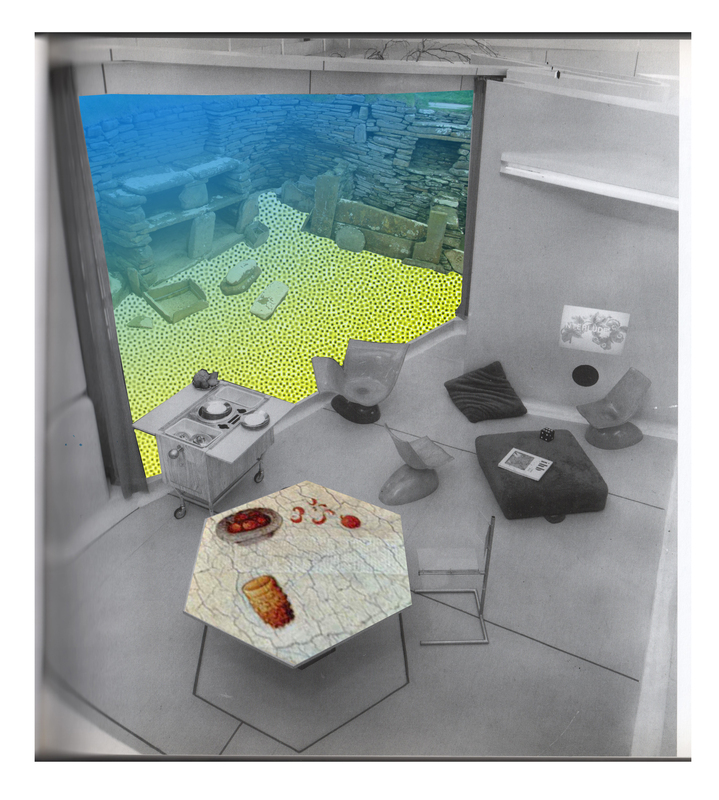 The second is the Smithson’s House of the Future, designed for the Daily Mail Ideal Home Exhibition at Olympia in 1956. One is a structure that has survived thousands of years, the other only existed physically for less than a month, and even then only as a kind of scenography sketching out the possibility of future living in the year 1980. 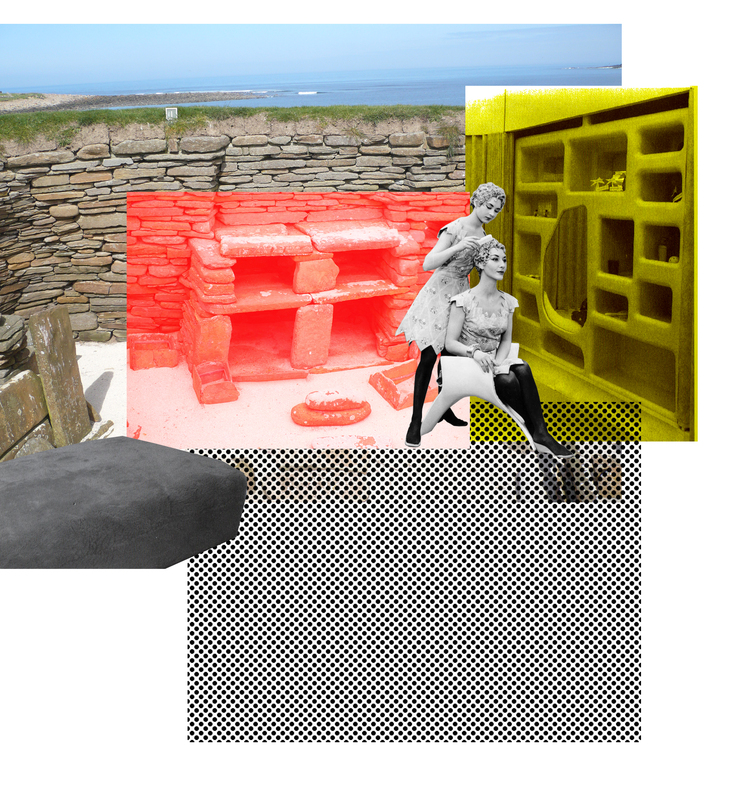 At Skara Brae, the walls of the structures are still standing, and alleyways roofed with their original stone slabs and the interiors retain to the fittings of each house that allow us to imagine what life might have been like. Each house shares the same basic design – a large square room, with a central fireplace, a bed on either side and a shelved dresser on the wall opposite the doorway. The House of the Future only exists through documentation – the design drawings for its production along with photographic record. Many of these photographs underscore the idea of this house as a theatrical performance of a possible future. Costumed actors lounge with the set, reading brushing one another hair, washing up, bathing all with the awkward poise of catalogue models. 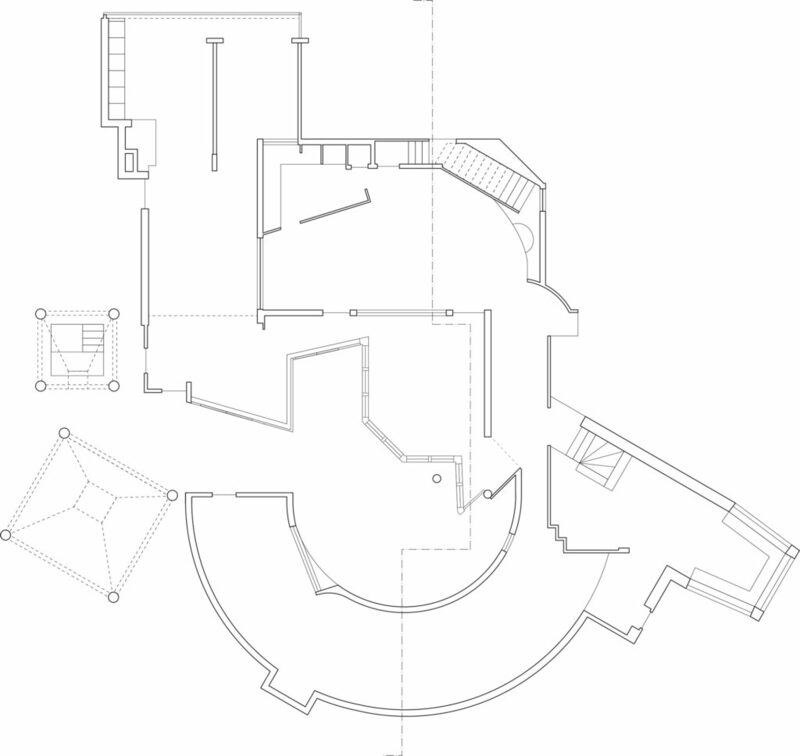 The house is arranged with amorphous blob-like spaces forming rooms arranged around an internal courtyard. What is striking is first their obvious differences: The chronological distance from one another, that one is a product of a agrarian culture the other born of electronics and consumerism and their material oppositeness – roughness of stone walls vs. smooth plastics. Yet they also seem strikingly the same: Architecture becomes furniture, furniture becomes enclosure, rooms flow into one another so that the disposition of living seems both evenly distributed, the floors of both seem remarkably active as domestic fields. Perhaps what they also share is an idea of fictive domesticity. One explicitly designed as a stage set for the theatrical performance of future living, the other something we can only inhabit with a retroactive imagination as a speculation on domesticity past. Both fictions play hard with our sense of reality – that other worlds have and will be possible. From two opposing flanks – from the past and the future – they argue that what passes for contemporary domesticity is far from a ​fait accompli. 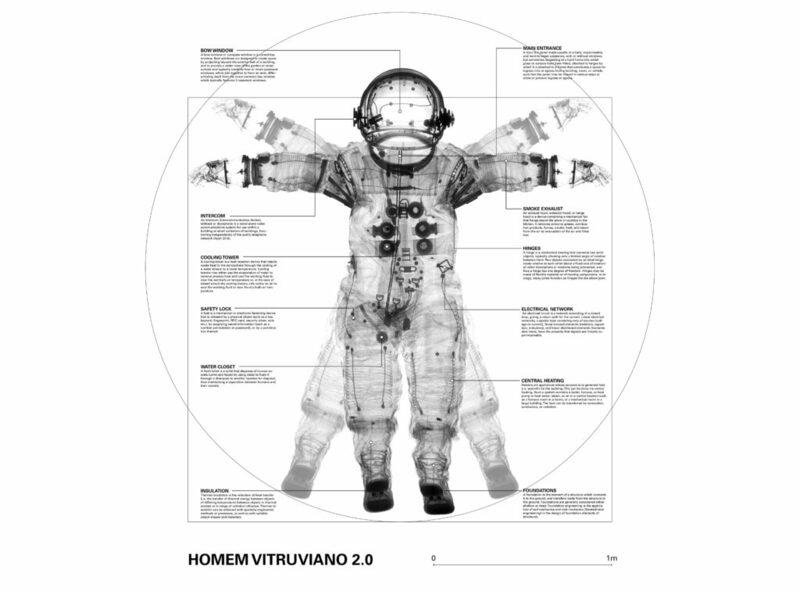 ​The past and the future contain radical provocations against our own ideals for living. 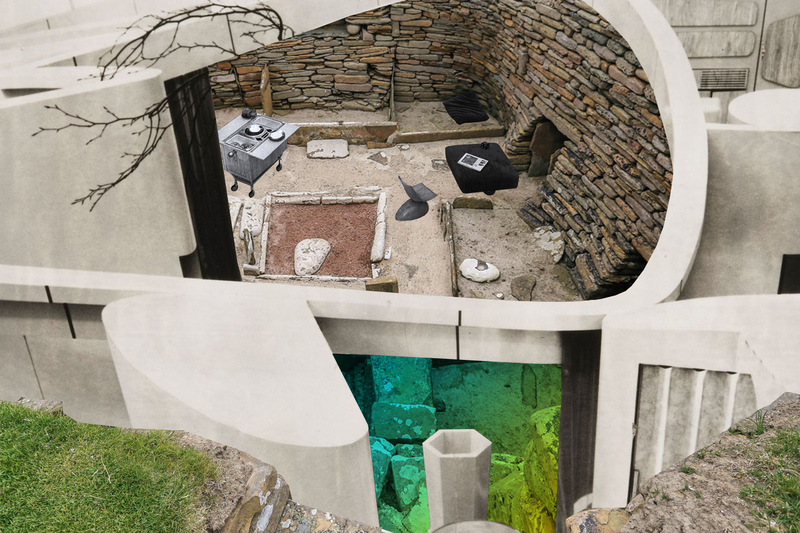 The Archaeographic House asks if its own form of futurist archaeology and can help rediscover new domestic potentials. Sam Jacob is principal of Sam Jacob Studio, professor of architecture at University of Illinois at Chicago, director of Night School at the Architectural Association, and the editor of Strange Harvest. Previously, he was a director of internationally acclai- med architecture practice FAT. Hello, How are you? How did you sleep last night? Did you dream of me all night? What would happen if we wanted to collect an architectural collection identical to a collection of paintings? Would it be possible to align the references, by reproducing them at their right scale and walking around within this “spatial gallery”, contemplating the works as if they were in a museum? Something is already happening. These works are not just assemblies of materials or constructive lines. They are also spaces that spread beyond their rights-of- way. Each of these works creates a form of “magnetic field” around it that affects their surroundings. In fact, to want to bring these iconic works together in proximity is to produce contagion effects, or even to take the risk of a certain spatial interference. But let’s take this risk! We can even bet that it will prove to be productive. When we think about our references in the housing programme, we do not think about the simple parameter of domestic organization. 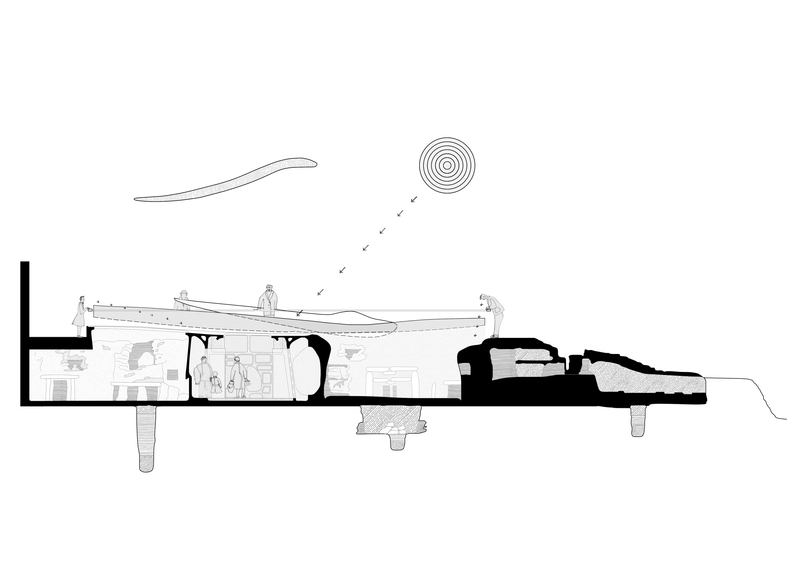 It is not only a question of articulating typologies to, for example, create a “building-villas” or a “collage to live in”. Let’s assume the idea of the collection to the end. And let us affirm the differences in scale between our references. Our architectural models are based on inspired design, resolving complex spatial and constructive issues, from a simple line to a simple assembly. This gesture, this momentum, we perceive it as well in the settings of a house-prototype as in the profile of a structural detail. We have verified it in a collage, or rather a simple superposition: the plan of Saint-Charles aux Quatre Fontaines by Borromini (1680) is part of the profiled outline of a pillar of the Basilica of Saint Peter in Rome (1626). The same virtuosity of the play of curves and counter-curves is at work in a baroque church plan and the profile of a structural element. Like a fractal, the quality of the drawing is reflected at all scales. The detail and the whole thing are formally answered. 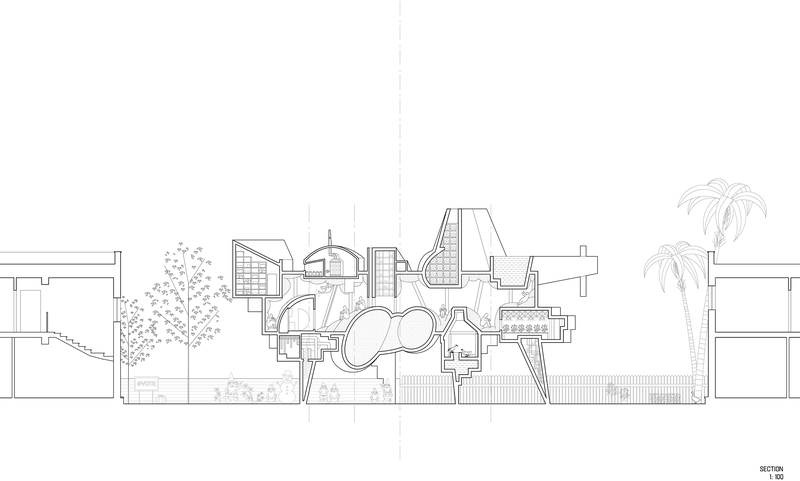 Our architectural appetites often push us towards “machine buildings”, each piece of which is part of a general mechanics, even going so far as to give the impression that the building “breathes” and can come out of its immobility (cf. Pierre Chareau’s La Maison de Verre in 1931 or John Lautner’s Chemosphere in 1960). How, then, to make this attention perceptible: to demand the same attention on objects of different size and utility. A collection of architectures must share this paradox. Rather than seeking unification, it is necessary to make these leaps of scale visible, but also to have fun making them practicable. 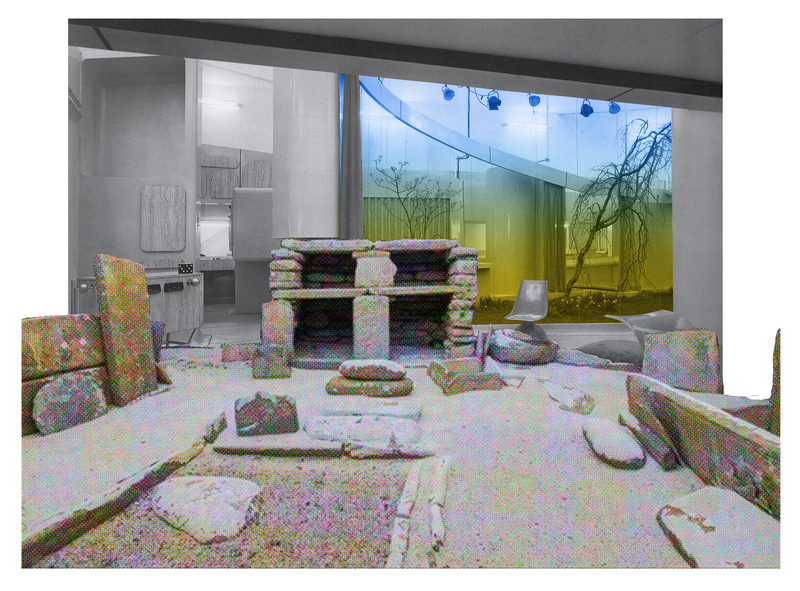 A Dogon fireplace, Paul Nelson’s suspended house (1938) or a post by Mies van der Rohe are equally worth seeing and even practising as such by the visitor. This is why we have made another challenge, as to the general organization of our “exhibition”. Rather than seeking a reasoned articulation, which would lead our different references to the manner of a spatial chain (or even a rebus), we assume an almost wild juxtaposition of the elements in relation to each other. 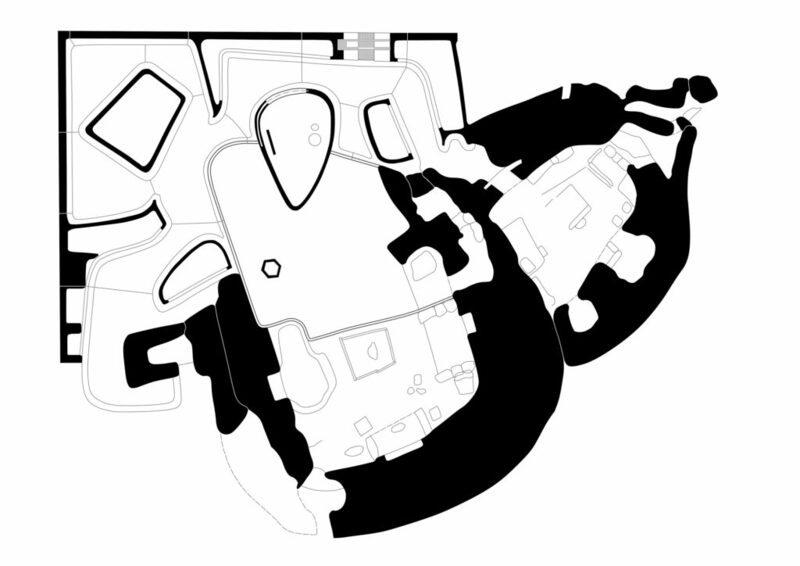 Rather than an overall plan, we propose a topological structure, based on two references that are a priori very distant from each other. The first is a re-reading of an ancestral form of socialization. The model of the Musgum village in Cameroon inspires us without being taken literally. 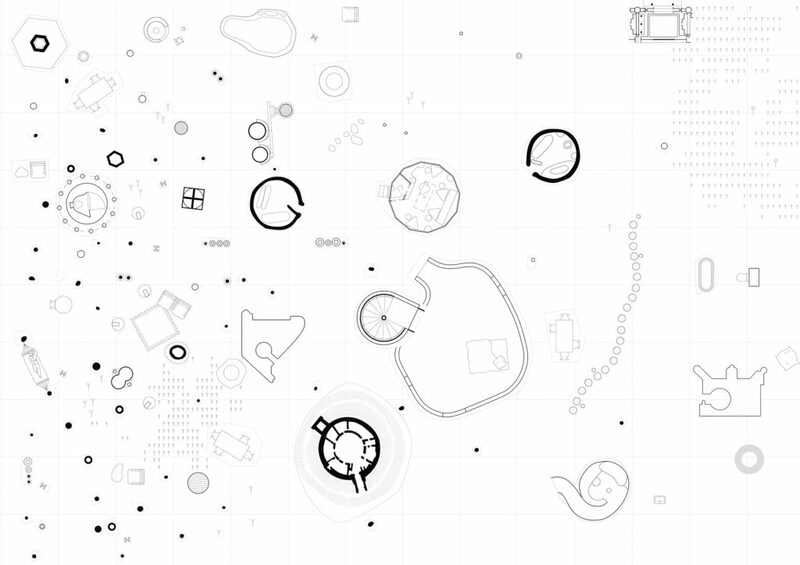 Is its circular shape the prefiguration of a “cluster urbanism”? Rather, we prefer to see it as a fractal structure, where the central public space is experienced as a social lung and the inside of the peripheral case-obuses as a “cell” of the overall plane. 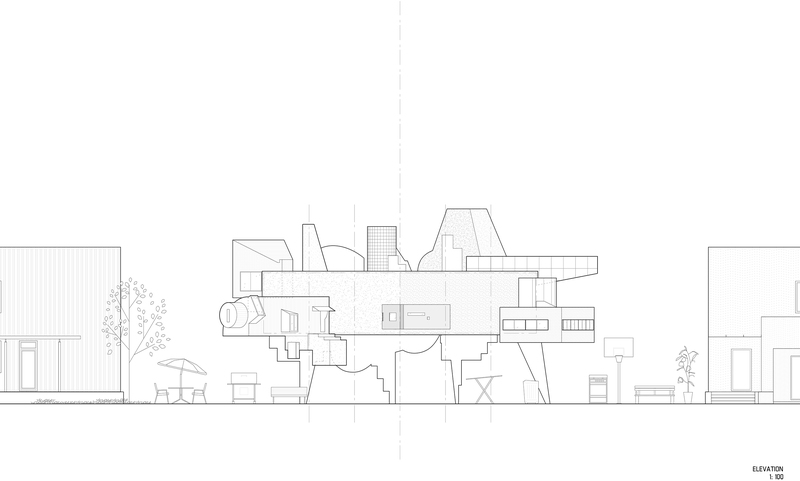 The second reference is that of utopian plans, Archizoom’s “paper urbanism”, plans deliberately without scale, related to some malicious graphic games. It is precisely the playful dimension of the approach and the vagueness of its application that stimulate us. Moreover, these plans mainly draw an impulse. The strength of their lines and the sharpness of their graphics go beyond the limits of their own plans. It is an open structure that takes the opposite of counted surfaces and restricted perimeters. We also adopt it as a real thumbnail to the constraints of housing architecture where every square centimetre is measured. The desire of communicating identity is all over suburban United States: why else would humans pepper their yards with decorative gnomes, Christmas ornaments, Halloween accoutrements, or other culturally specific imageries that help form a source of identity? By extension, the aesthetic qualities of architecture itself performs a similar role. The suburban United States is both a condition of a declaration of a public self, as well as a security of the private self. Whereas the front of the house is an opportunity to conform through the decorations, the backyard is a location to retreat. In the backyards of suburban Los Angeles, private properties are often physically defined by fences, hedges, or walls. Within the suburban blocks, slivers of lines are drawn to accentuate the “privatize everything” sensibility from the 1980s. Unlike the Barcelona block where the notions of private and public are blurred, the backyards of Los Angeles suburban houses are as black and white as the Nolli Plan – nothing is shared, and an ideological border cuts cleanly who is or is not welcomed. In our 2018 “Yes to ADU” competition entry, we (Bureau Spectacular) proposed an alternative to this urban condition. The purpose of the ADU (Accessory Dwelling Units) is to combat the shortage of housing stock by supplementing it with additional backyard homes. However, as opposed to perpetuating the notion of the absolutely private backyards for people to retreat, we think ADUs can help erode the rigidity of the property lines between neighbors. If we consider these ADUs to be micro versions of “housing-plus” projects, the “plus” can be added infrastructural functions benefiting the entire block, rather than the individual property only. For example, an ADU can dual function as solar power collectors, water processing systems, or collective fermentation stations – infrastructures for the full block. By benefiting the full block, the backyards of the LA suburban block has a chance to transform from individual properties into a space for something collective. It allows the typical LA block to dilute the strength of individual boundaries to become a permeable courtyard condition. The House Between Properties (2018-2019) is a version of such a backyard infrastructure – it is a shared ADU between several neighbors. This collective backyard house is a box that hovers over several legal property lines, and are structurally supported by the infrastructural components that help distribute added quality of life across the suburban block. These infrastructural components attached to the box are sampled from various works of architecture – each surgically removed and programmatically transformed to have a new function parallel the suggestions left behind by the previous works of architecture. 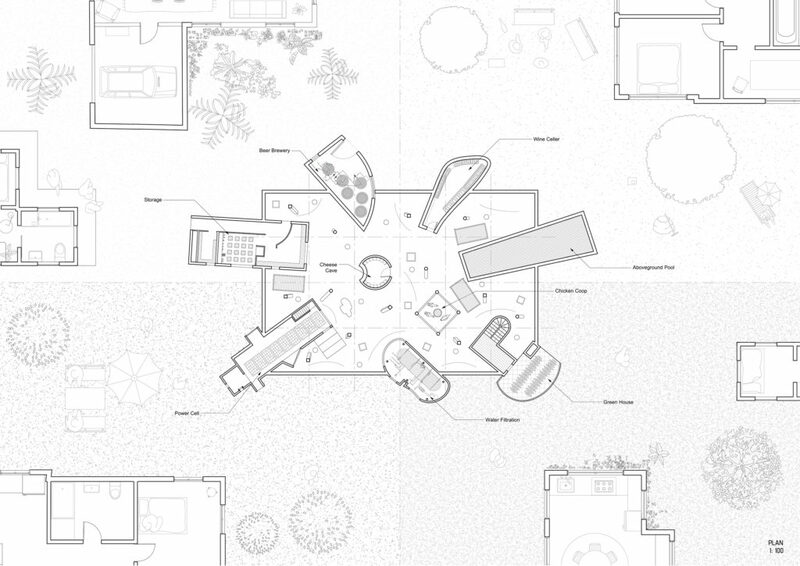 Although the plan of the House Between Properties permeate across property lines, the section and elevation function not so dissimilar from the aforementioned gnomes or decorative flamingos – it is a place where a mash-up of collective identities in a backyard may become possible – and, in doing so, the individual private backyards may become a collective courtyard. Bureau Spectacular imagines other worlds and engages the design of architecture through telling stories. Beautiful stories about character development, relationships, curiosities and attitudes; absurd stories about impossible realities that invite enticing possibilities. The stories conflate design, representation, theory, criticism, history and taste into cartoon pages. These cartoon narratives swerve into the physical world through architectural installations, models and buildings. JIMENEZ LAI works in the world of art, culture, and education. Early in his career, Jimenez Lai lived and worked in a desert shelter at Taliesin and resided in a shipping container at Atelier Van Lieshout on the piers of Rotterdam. Before founding Bureau Spectacular, Lai worked for various international offices, including MOS and OMA. Lai is widely exhibited and published around the world, including the MoMA-collected White Elephant. His first book, Citizens of No Place, was published by Princeton Architectural Press with a grant from the Graham Foundation. Draft II of this book has been archived at the New Museum as a part of the show Younger Than Jesus. Lai has won various awards, including the Architectural League Prize for Young Architects and Debut Award at the Lisbon Triennale, and the 2017 Designer of the Future Award at Art Basel / Design Miami. In 2014, Lai represented Taiwan at the 14th Venice Architectural Biennale. In 2015, Lai organized the Treatise exhibition and publication series at the Graham Foundation. Alongside MoMA, Lai’s work has been collected by SFMOMA, Art Institute of Chicago, and LACMA. Currently, Lai is a visiting faculty at Columbia University, and heads a Supra Studio at UCLA. This is the tale of a strange house once imagined for a house collector. Mister Collector, as we may call him, used to live in five glass houses. He had bought these five houses over the years, not by necessity, but as a way to fulfil his love of glass architecture (he had German origins). Due to his eccentric and intense character, he could not stay more than a few days in a single place, and his life was about to travel from one house to another. And always in the same order. Once he had visited them all, he would simply go back to the first one, visit all the others again. Just like Howard Hughes, the famous aviator who used to live in a series of strictly identical apartments spread around the world, his life was about experiencing speed. The speed he was seeking was not yet the same speed as that of a bullet train or a sport car. Rather, it was a kind of inertia. A speed so absolute that it would become like static. Having bought these five beautiful glass houses, he had managed to combine his contradictory desires of speed and architecture. One day, he thought he had become to old to keep moving from one house to another, and decided he would gather all his collection in a single place, so as to live in all his houses at once. No more travelling ! No more moving from one house to another. The houses had to move to him. He called his architect who suggested to deconstruct all five houses and reconstruct them in the same place, arguing that glass houses were particularly suited for deconstruction and reconstruction. Mister Collector enthusiastically accepted. His houses were then unbuilt and rebuilt on the same plot. But not just one next to the other, but really intertwined with each other, so as to make one house out of five. The result was a kind weird space-time compression. A house with five bathrooms and his five kitchens. A labyrinth of crisscrossing glass panels, steel structures, flat and slopped roofs, stone and wooden floors, decorated with an eclectic set of original pieces of furniture, carpets and vintage appliances. Mister collector could then live in all his five glass houses at once. Trapped in his own crystal castle, he found what he had always looking for: enjoy his entire collection and feel like waking up in a new glass house everyday. 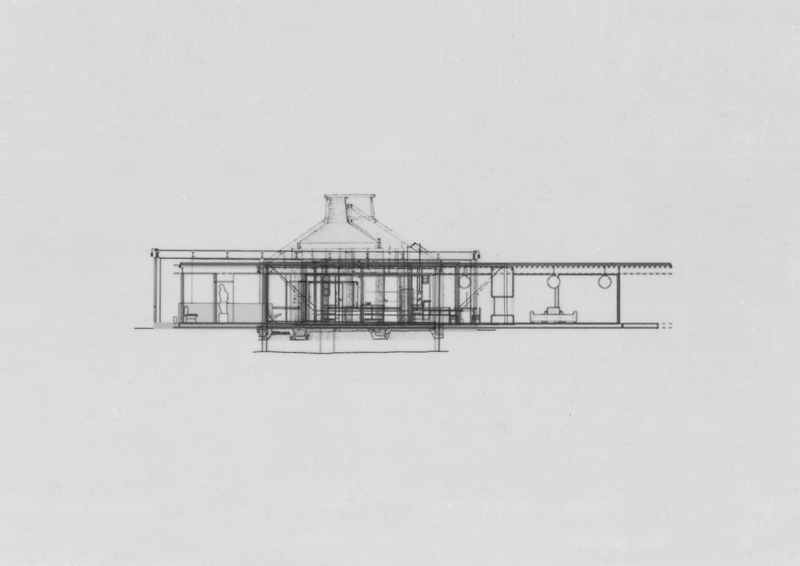 Philip Johnson, Glass house, 1949. Mies van der Rohe, Farnsworth house, 1951. 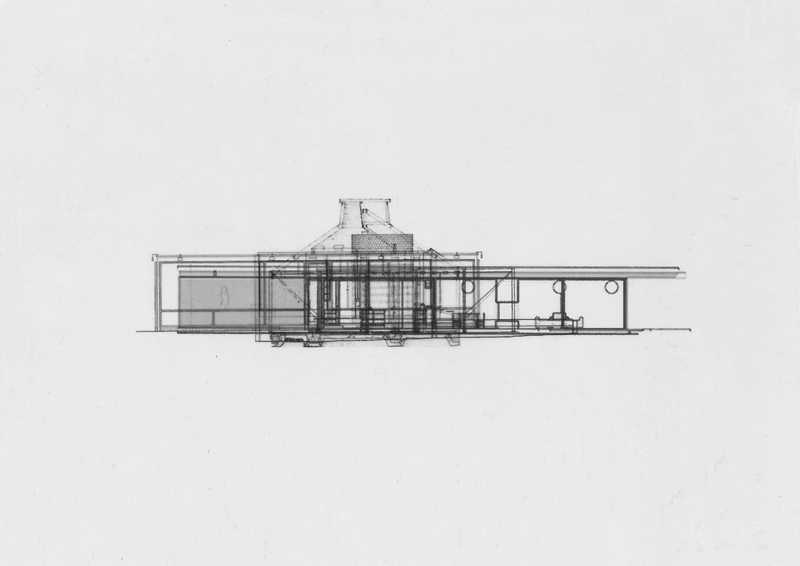 Paul Rudolph, Walker Guest house, 1953. Pierre Koenig, Stahl house, 1959. We are in a time that is characterized by upheavals. Technical achievements are changing the world faster than ever before. Developments in the fields of digitalisation, robotics, biometrics, genetic engineering, and so on, have fundamental effects on our existence and question things that have long been regarded as permanent. Despite these radical changes, architecture can be something continuous – integrated into its long history. Good spaces retain their validity over centuries. A room in a Palladian villa touches us even after 400 years since its creation, although life today is very different. It shows how spatial quality can exist for a long time without losing its effect on us. This is achieved when the elements of architecture are used wittily to compose a space and its proportions and materials are right. In the best case architecture is then culturally sustainable and can create identity. Just as a text, image or music can touch us over centuries, so can a room or building do the same, even though we do not know the author and his intentions. important to us. Some of the rooms serve as placeholders for the ideas of their authors: the sala of the Villa Cornaro forms the center of the dwelling collage. Other rooms are arranged around it like satellites. The dining room of Karl Friedrich Schinkel’s Feilner residence in Hasenhegerstrasse in Berlin is placed adjoining to the sala. It is a room intended for preparing food harvested from the garden, but it can also be used as a meeting room. Attached to the dining room is the chimney room from Adolf Loos’ private apartment. 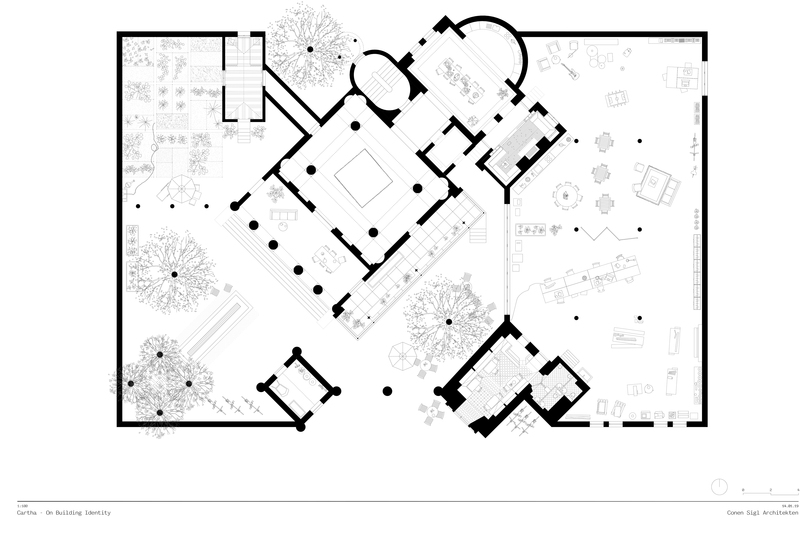 A continuous axis connects the kitchen with the sala, the portico and the garden. In this axis the large stone table from the Villa Lante is placed, which is dining table and fountain at the same time. It can be used for communal meals. The garden pavilion, which is based on the Primitive Hut of Marc-Antoine Laugier, forms the end of this axis. The winter garden of Villa Tugendhat by Mies van der Rohe makes it possible to overwinter the plants of the garden – it acts as a threshold space between inside and outside. Andy Warhol’s Silver Factory, directly adjacent to the residential building, is a symbol of a space that allows multiple use. It embodies the idea of an open workspace, a place where ideas and other things can emerge. A fragment of Hermann Czech’s Kleines Café is built next to this large, open space – an intimate, small-scaled public room. In the garden there is the tent room by Karl Friedrich Schinkel as a demarcation of the vegetable garden. It serves as a place of retreat: the tent as an image of temporary dwelling, of mobility – but here depicted in a built, fixed and immobile form. A space as an expression of a lifestyle. The entire spatial conglomerate is conceived at the same time as a living and working space with common rooms on the ground floor and private rooms on the upper floors. There is also the possibility of self-sufficiency with a vegetable garden and the option of keeping small livestock. 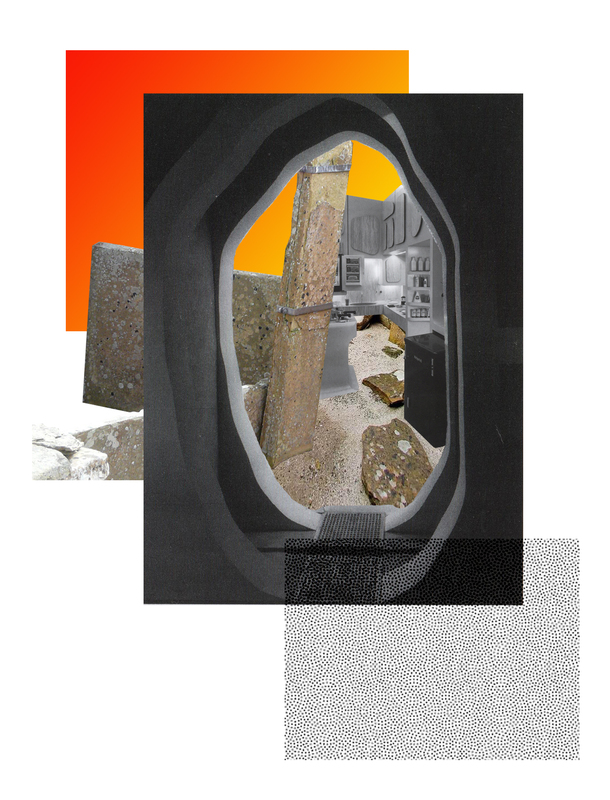 Our collage formulates the vision of a living form which combines the characteristics of a private villa with those of public spaces – the autonomy and determination of a villa merged with the openness or generic qualities of a Silver Factory. The chosen spaces offer the possibility of multiple use without losing their strong atmosphere and identity. Conen Sigl Architekten was founded in 2011 by Maria Conen and Raoul Sigl after their studies at the ETH in Lausanne and Zurich. The work of the office during the first years was mainly focused on smaller projects and conversions. These projects in existing structures allowed them to develop a specific attitude and achieve their own formal language. Their architecture aims to create strong spaces with specific atmos- pheres – for both interior and exterior spaces. 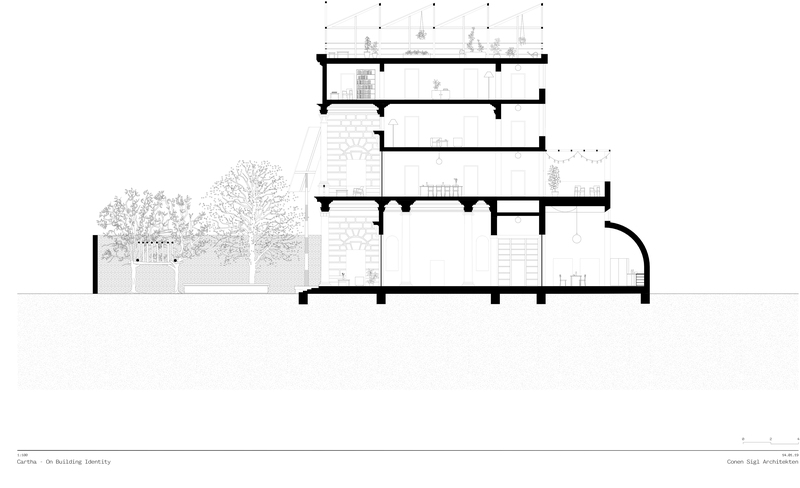 In addition to smaller scaled projects they are currently working on the renovation of the Kunsthaus Glarus, on an urban housing project and a fire station in Zürich. Parallel to these building activities, the office is involved in cultural projects. They were responsible for the exhibition de- sign of the Manifesta 11 in Zurich and are supervising the exhibition design for the Swiss Art Awards in Basel since 2017. Maria Conen and Raoul Sigl are both active in teaching besides their work in the office. They taught at the ETH Zürich, were Guest Professors at the TU Munich and are teaching since 2018 as Guest Profes- sors at the TU Dresden. When buildings meet, they might embrace or reject each other, or start a dialogue. Such encounters might end up in sheer powerplay, while assimilation and appropriation might be the decent, proper solution. How to achieve a new balance while respecting mutual intrinsic characteristics, when building up a new coherence? The current gathering is between six epic plans. Each one has been selected because of containing a specific type of ambiguity. We find them in a heated debate, meanwhile a new cohesion seems to arise. 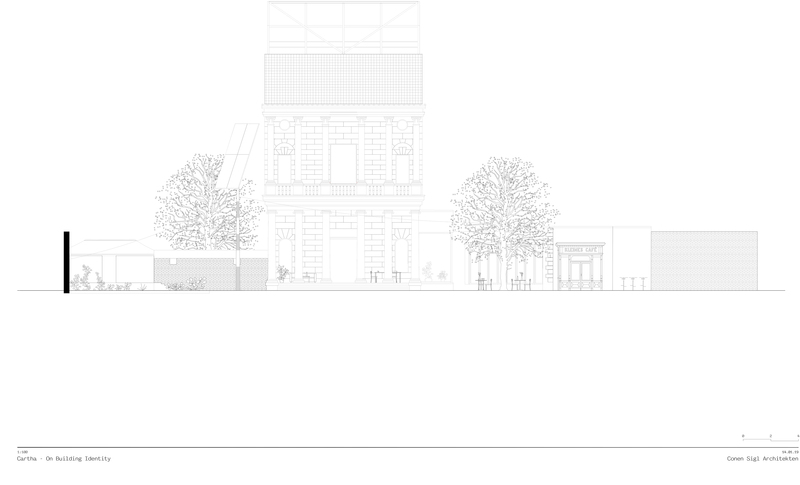 Monadnock is a Rotterdam-based architecture firm. In addition to designing and producing buildings, Monadnock researches, writes and generates discourse in the fields of architecture, urbanism, interior and staging – varying in scale from the space of the city and streets to the scale of the interior. Monadnock creates contemporary buildings that embed architecture in the broader cultural production of the current generation, taking inspiration from various creative disciplines. By examining key themes, such as contemporaneity and tradition, convention and banality, constructive logic and illusory representation, Monadnock strives for an architecture that combines beauty, efficiency and the transfer of architectural knowledge. Monadnock was founded in 2006 by Job Floris and Sandor Naus. Both initially trained as interior and furniture designers during their studies at the Academy of Fine Arts and subsequently graduated from the Academy for Architecture and Urbanism. Monadnock has received international attention for realizing characteristic bespoke buildings. These include a beach pavilion on the River Maas, a huge temporary installation in the public space titled “Make No Little Plans,” the “Landmark,” a viewing tower in the heart of a small municipality, shortlisted for the Mies van der Rohe Award in 2017, and the “Atlas house” in Eindhoven, which received a Brick Award in 2018. Currently, Monadnock is involved in projects on various scales, ranging from housing projects in several sizes to the design of a new visitors’ center for the Hoge Veluwe National Park, due to open in June 2019.